SarahG... Sorry for not posting last night- the weekend finally caught up with me and I was sound asleep at 9:40 last night- I never got on the computer!! Here's a card for you today using all new supplies from the upcoming Summer Idea Book!! 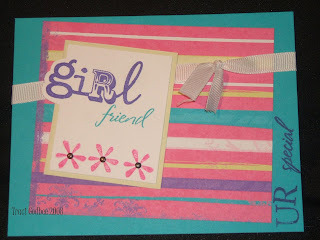 I used the brand new Whoops A Daisy paper pack and the new Be True Stamp Set- this stamp set is awesome!! I've made 3-4 cards with it already and each is totally different- lots of different looks are possible with this one!